Get some spicy, tasty goodness in your canning, cooking and eating. There are a lot of things to eat that can enhance your meals. 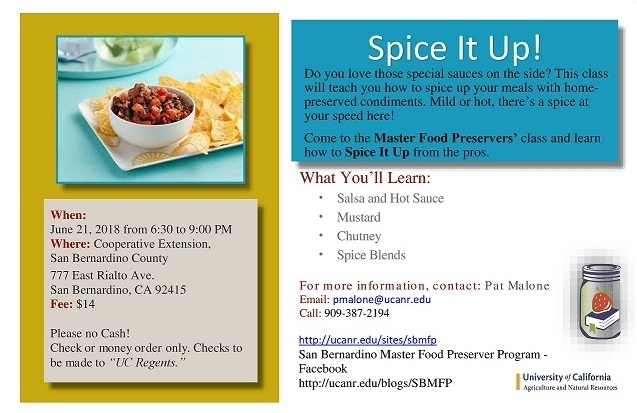 Our "Spice It Up" class is coming up. Make sure you sign up and don't miss it! June 21, 2018; 6:30 p.m. to 9:30 p.m. 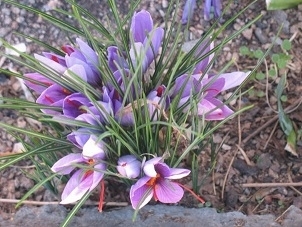 I was cruising the Agriculture and Natural Resource (ANR) blogs and found this nice article about growing saffron crocuses in your yard: Grow Your Own Saffron! Such a pretty flower with delightfully tasty seasoning included!It is a little late to plant these little beauties around here, but you could put an order in for some corms and plant them when shipped to you, which is usually in the fall. How about a recipe to use some home canned broth and home grown saffron? Quite a while back I bought one of those little boxes of Sahara Brand Rice Pilaf. We all liked it but it was expensive. My sister and I got together to try to concoct our own version. The following is what we came up with and we like it much better than the boxed stuff. It is now one of our family's favorite recipes it is as follows. A few tips for this recipe: make sure to toast the rice, then the pasta, almonds and you will get a great flavor and texture to your pilaf. Have you made any home canned chicken broth? It will serve you well in this recipe. You can make this without the saffron, but the spice adds a very nice, rather exotic aroma and a wonderful color to the dish. Try to find some real Spanish saffron and use it--you won't be sorry. Rice and Orzo Pilaf with Saffron--Use some Home-Canned Broth here! Recipe may be doubled if you wish. Mix the broth and warm water then sprinkle the saffron over the top. Set aside. Heat the olive oil over medium heat in a large saucepan. Pour in rice, stirring constantly to avoid burning until it loses its translucency and all the rice is opaque, much more white and some of the grains are beginning to get browned. Add the orzo/vermicelli and almonds and continue to stir constantly until the pasta browns; this should happen pretty quickly. Place the onion and salt in the pot and stir until the onion is translucent and soft. Add the broth, water and saffron and give everything a quick stir. Cover, reduce heat to a simmer and cook for about 15-20 minutes. Test for doneness of the rice; it should be firm, but not chalky or hard; if it is, add tablespoon or so of water and cook for a few minutes. Remove from heat and let stand about 5 minutes. Taste for final seasoning then add salt if needed, stir lightly but thoroughly to fluff and serve.